I think you are wrong with regards to electric bikes… They aren’t simply the domain of old folks who can’t ride anymore. 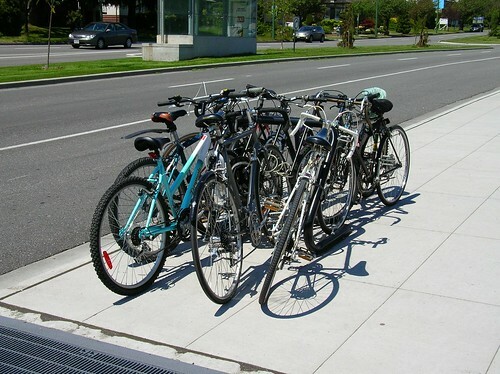 They are a fantastic enabler that allows the bicycle to be used for trips that otherwise wouldn’t have been possible. Case and point: I have a friend who lives by Lynn Valley, and owns a shop on Commercial. Now that he has an electric bike, he rides to and from work nearly every day. Before the electric bike he would ride once in a while, and use his van the rest of the time. Another friend I have has 2 kids and owns an electric bike. He can put his daughter on her trail-a-bike and have his son in the bike seat up front, so the kids start experiencing bicycle transport right from a very early age. With the electric assist he is able to take them on long rides all over the place in Vancouver, showing them places they couldn’t go otherwise. The key phrase is “electric assist”. It is much different from those stupid plastic-shrouded “electric bikes” that aren’t actually rideable without power – those are more like a vespa, not a bicycle. A true electric bicycle (not a scooter) is a bicycle that has some extra kick when you need it. You can ride it just like a bicycle without ever engaging the motor. When you give someone the ability to ride 20km and get there nearly as fast as they would in a car, you are creating a huge advantage for the bicycle. Because you have a motor, suddenly picking up 15lbs worth of groceries on the way home isn’t so bad. Now you don’t get in the car because there’s a hill on your route – you can glide up it. It’s a total game-changer. The cost and performance of these systems has just reached the point where the conversion kits are affordable, the battery lasts long enough to do what you need it to and the weight is low enough to actually enjoy riding the bike sans-electricity. There’s no downside!! I am not wrong – I am simply expressing a somewhat restricted view. I want to see a lot more people using their own muscle power to get around since the health benefits are huge. I am well aware of the difference between an electric scooter and a power assisted cycle. And the cases you mention are admirable. I am also aware of people who damage their own health simply because they are so reluctant to increase the amount of exercise they do – and that would have to include me. The problem is our current transportation system and our cities are desighed around oil based transportation. To cost effectively make the switch to electricity and human power, the transportation system and communities have to be designed around electric powered transportation. That means light weight electric and human powered vehicles for short trips, electric rail and buses for regional trips and high speed electric rail for long trips. Batteries are just too heavy and expensive to power the heavy cars needed to give occupants a chance of serviving high speed impacts. For long trips, cars need to carry more people, luggage and travel at high speeds all of which drains battery life. Climbing the mountains and the hot and cold temperate extremes in BC also limit the range of batteries. Really, our only option is electric trains. At the high frequencies needed to provide the service required for high levels of transit use, often transit priority measures really aren’t that effective. Priority can negatively affect transit on crossstreets as well as negatively affect walking and bicycle travel times. At the levels of transit we really need, there is a strong business case for grade separated transit. Ah, but an electric bike is most definitely human powered! They aren’t really meant to be used solely under electric power, and you won’t get up hills nor get much range if you try and run them purely on the battery. They multiply what you put in to them. And really, people who don’t get enough exercise are perfect candidates. You get lured in by the idea of an assisted ride and end up discovering just how much fun it is to ride absolutely everywhere. Next thing you know, you’re getting far more exercise than you ever were before plus you’ve gone a long way towards freeing yourself from car dependence, or really even transit dependence if your circumstances allow it. No, I don’t currently own one, I don’t sell them, but I sure do want one!! 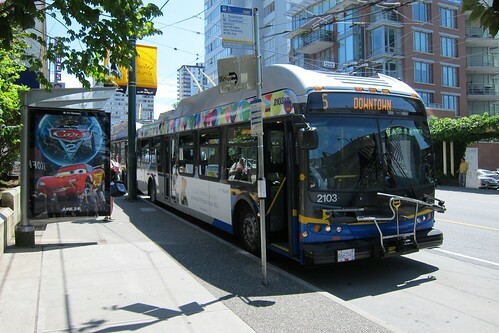 (see why it is important here: http://voony.wordpress.com/2012/11/09/bus-capacity-some-remarks/ ). In Transport Revolutions (Richard Gilbert and Anthony Perl, 2010: http://transportrevolutions.info/) the advent of hugely expanded electrical grids powered from low-emission sources was expounded upon. Though in BC we are blessed with great hydro electric assets, there is an increasing awareness of the destruction building dams imposes namely on our scarce agricultural soil resource. In discussing alternate energy one must distinguish between base load (centralized) and intermittent (decentralized) power. There is sufficient evidence (and many critiques) on renewable energy that justify emphasizing the development of new clean base load energy sources that are available anytime on short notice as either primary power or backup to intermittents like wind and tidal, and one promising source is closed-system geothermal near BC’s many volcanic sites, like Meager Mountain. This will require lots of R&D, but it looks like places like Iceland are advancing this energy source with experimental seismic mapping and drilling close to magma domes and supercritical reservoirs of water located 3000-4000 metres below the surface. 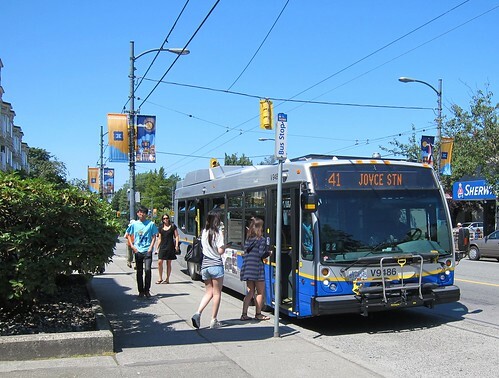 Expanded electrical grids make a lot of sense when considering the efficiency of Vancouver’s electric trolleys that often outlast their diesel counterparts because of the simplicity and higher efficiency of electric motors. Higher liquid fuel costs hit already financially-constrained organizations like TransLink quite hard and force management to make poor decisions, like purchasing cheaper bulk orders of lower grade, higher particulate, high-sulfur diesel that has a direct effect on asthma and local emissions. Gilbert and Perl advocate establishing regional and eventually national electrical grids to service the transport sector, including electrifying the rail transport of heavy freight and building a continental high-speed passenger and light freight network. This, of course, will require new sources of renewable, low or zero emission energy, and could stimulate a revolution in local low emission industry (e.g. steel and Portland cement making) electric induction kilns) powered by a couple or three large geothermal power plants within a reasonable transmission line range of the coast. Lowering our per-capita energy consumption is probably the first step, as Stephen suggests by in part switching to more public transit from individual private transport. Capacitors, solar panels, wind farms, and even tidal all have their limitations, and one of the least examined and most misunderstood by advocates is the cost of networking them and subsidizing intermittent energy prices over the long term, and the emissions required to build them in the first place. Wind and localized solar will play a role in lowering demand on the grid, but the grid is where our alternate energy developments should start. If tiny Iceland can scare up a few million to conduct this significant research, why can’t Canada? Because of the influence of petroleum lobby on provincial and federal governments. There’s no money for this kind of effort as taxes have been reduced and subsidies to fossil fuels run in the billions. Higher liquid fuel costs hit already financially-constrained organizations like TransLink quite hard and force management to make poor decisions, like purchasing cheaper bulk orders of lower grade, higher particulate, high-sulfur diesel that has a direct effect on asthma and local emissions. But that is not to suggest that Coast Mountain Bus Company has actually done so. In fact the sheer volume of diesel purchased and longer term supply contracts have tended to secure cheaper diesel for Translink. BC has its own very stringent fuel quality standards based on CARB – or perhaps I should say we did have at one time. I not sure this has survived the present administration’s search for rule cutting. Good observations, Stephen. If only 10% of the money that currently subsidizes the tar sands, let alone fracked gas and oil, could be redirected to geothermal at the hot rock sites in BC and Yukon, there would be great progress potentially to help wean us off of fossil fuels in Western Canada. The Pembina Institute estimated that the subsidies on the astromical volumes of natural gas burned in tar sands operations equate to about half of the entire volume. I do remember a cerfuffle a few years back on the purchase of higher-sulfur diesel by CMBC. A few notes on the high cost of intermittent renewable energy sources. Nicole Foss posted a rather long piece on The Automatic Earth on this topic that, in my interpretation, takes a rather pessimistic view. However, she correctly iterates that advocates must address several relevant issues like connecting, for example, offshore wind farms together with expensive transmission cables to balance intermittency and to supply back up power when the wind doesn’t blow. She cites a case in point for a wind farm proposal in one of the best offshore sites in Scotland that will require a single $1.6 billion undersea cable (to be eventually paid for by UK ratepayers) to Norway to export wind energy, while Norway will export back up hydro energy via the cable when the wind doesn’t blow in Scotland, often at high-rate peak times. She calls it a great deal for Norway because their hydro energy takes advantage of its already significant energy storage capacity and would refuse to import Scottish electricity at higher prices. Norway will essentially receive a subsidy on behalf of ratepayers in the UK on the equivalent energy that would otherwise be deducted from the reservoirs for the same if not a lower price. Moreover, several more billion dollar cables will be required to eventually even out the uneven nature of the wind by connecting together widely-spaced wind farms planned for the offshore UK. The primary way to pay for new transmission networks is through apportioning feed-in tariffs as such, essentially a subsidy on the higher cost of these new energy sources that proponents, like Germany, are now leaning away from. Perhaps the mistake here again is forcing intermittent power to act as base load power (i.e. to be available on demand at affordable prices). As a supplemental to domestic hot water or electrical use in energy efficient buildings, rooftop panels make a difference. But as massive energy farms where even minor power intermittency plays havoc on sensitive industrial processes, solar and wind require a lot of taxpayer subsidy in order to bring in backup power and to even out the peaks and valleys of wind speed and sunshine even when the cost of manufacturing the units has decreased significantly. I’m a bit critical of her reliance on one source (Vaclav Smil) for the majority of her analysis, and for passing over geothermal power without really understanding it (it doesn’t rely only on limited reservoirs of superheated underground water; it comes in several forms), but her comments are a welcome blast of cold air to clear the stuffed up techno-vision and lack of economic acumen of some alternate energy aficionados.